WEST HARTFORD — At Thanksgiving last year, Eric Zeiberg and his family were having dinner with family friends, one of whom suffers from muscular dystrophy, the 12-year-old recalls. That friend, a physician, has lost most of her speaking abilities and was writing on a notepad to carry on the dinner conversation. At work, she would do the same, and a nurse would read it to her patients. Growing up with a non-verbal older sister – 22-year-old Julie, who is autistic – has helped Eric understand how frustrating it can be for people who have difficulty speaking. "Eric grew up with Julie … When he was born, Julie was 10," said their mother, Maya Zeiberg. "It's very interesting to see how they interact. Very quickly from a younger brother he became like an older brother, though he's 10 years younger." "Julie gets very frustrated when she cannot express herself, and she starts yelling … we understand what she wants most of the time, but not all the time," Maya Zeiberg said. "We were thinking, and he was thinking, about the whole population of speech disabled people." Eric combined two software development kits – starter kits for code writing – to develop the program. 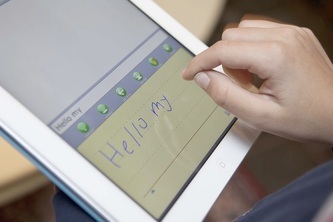 One was a handwriting-to-text program, the other was a text-to-speech app. "Our friend said it's very meaningful to him because [his wife] actually" can have a conversation, Boris Zeiberg said. "If somebody never could speak, it's different from losing their voice … it's very meaningful for their whole family."